The first sock yarn from Zealana. 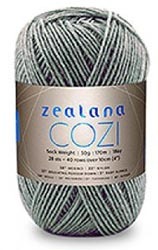 Designed for durability while maintaining the possum softness, Cozi is perfect for a great pair of socks, or any project worthy of Zealana yarn. Learn more about possum here.